Underneath a beets rugged exterior, lies a sweet flavor with a health boost. Beets can be used in a variety of ways, ranging from food coloring to medicine and from table sugar to animal feed. There are numerous health benefits of eating a beet. Recent lab studies on human tumor cells prove the purple pigment in beets, betanin, to assist in decreasing tumorous cell growth. The oxalic acid in beet juice reverses chronic diseases, such as arthritis, kidney stones, and heart disease. Beets also contain an outstanding amount of folic acid, manganese, vitamin A, vitamin C, vitamin K, and calcium! All these nutrients are essential in maintaining optimal health. 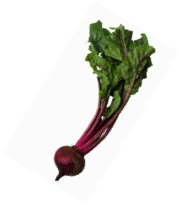 To reap all the benefits in this “super” vegetable, simply peel a raw beet and grate over a salad. Beets may also be boiled for a softer texture or juiced. Remember, heating beets will denature some of its nutrients. With their delicious and unique taste, high concentration of nutrients, and multitude of uses, beets are an obvious choice for a nutrition-seeking individual.